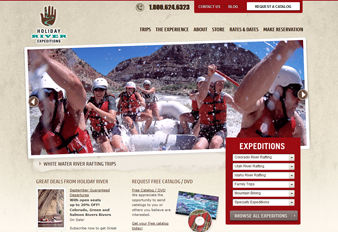 Holiday River Expeditions is an adventure-filled guide and tour company that focuses on offering river rafting and mountain biking tours of Utah, Idaho and Colorado. Additionally, they offer family trips, women’s retreats, multi-sport combinations for die-hard athletes and youth trips. Their specialty excursions include spiritual rafting retreats, naturalist retreats, kayaking workshops, hikes, bird watching trips and historical excursions back in time. Their highly experienced staff is extremely professional and strives to make each excursion memorable. The Utah based Adaptivity Pro was founded in 2004 and offers web design and Internet marketing assistance to a variety of clientele. Started by entrepreneur Eric Morgan, Adaptivity Pro has thrived since their launch and they continue to grow with their expansion of Internet marketing services, such as SEO and PPC. Adaptivity Pro is committed to providing the best design and Internet marketing services at the most reasonable rates to clients of every size.